Should Bronchiolitis be Treated with Antibiotics? 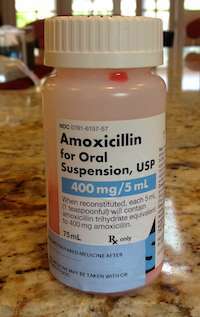 Our pediatrician gave us Amoxicillin for Bronchiolitis 1 week after cold symptoms started even though she was already improving cough wise and less gunk. We didn't give it to her after reading that it's usually viral since improvement continued. Hoping we did the right thing. There are many viruses that cause bronchiolitis. Typical cases last 2 weeks to 2 months. The most prolonged and severe cases are usually caused by RSV (respiratory syncytial virus). The major symptom is a short dry cough. While the cough occurs all day long it tends to be worse at night and with activity. When listening with a stethoscope you can hear a wheezing sound during expiration (breathing out). Symptoms of bronchiolitis gradually worsening, peak out half way through the illness, and then slowly resolve. Eventually, bronchiolitis will resolve on it own. Although albuterol breathing treatments are of questionable benefit for bronchiolitis they remain the mainstay of treatment. Typically these treatments involve holding a mask on the child’s face for 5 to 10 minutes. It is safe to say that most children do not like getting these treatments. These albuterol nebulizer treatments help some children cough less for 4 to 6 hours. While children with bronchiolitis are at increased risk for bacterial infections (like ear infections), there is no need for antibiotics in most cases of bronchiolitis.